My friend got married last summer and her menu included an amazing chocolate dessert so she didn’t want a wedding cake… but wanted a wedding cake. She decided to make her wedding cake a cheese course for the end of the night instead of dessert and people loved it. 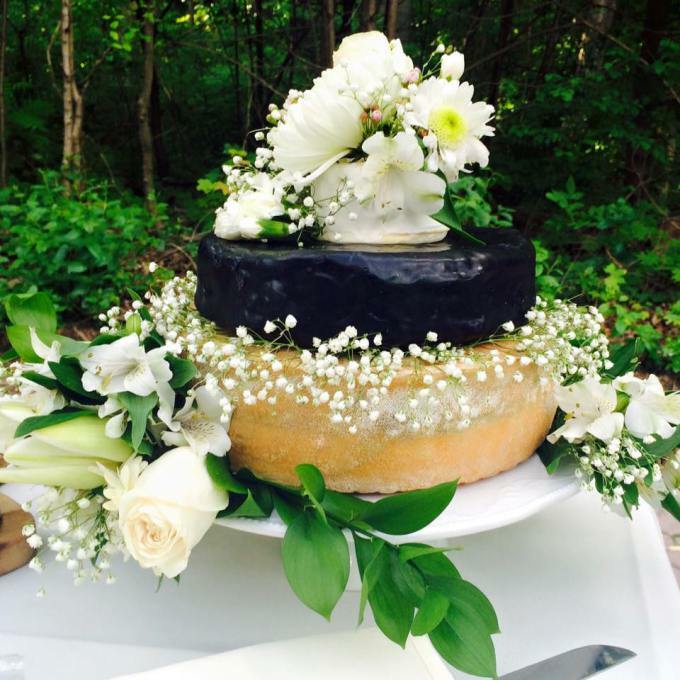 Cheese-wheel cakes are gaining popularity as a fun and beautiful alternative to a traditional cake with icing. They are expensive though, and can cost more than a traditional wedding cake. The thing is, they are quite easy to make and allow you to let your creativity and flair shine. I made this one for my friend’s wedding. The base is Quebec Oka, the middle a blue cheese, and the top a goat’s cheese. Her colours were a soft yellow and white so I chose white flowers with slight hints of yellow. My friend loved it. She said it looked like a fairy tale. Here are my tips for making this cake. Go to a cheese monger and per-order your cheese. Make sure it’s something you like. Taste the cheeses before you buy. Make the base – the biggest wheel a mild one, like cheddar, the middle can be anything from a blue cheese to some unique mix, and the top a soft goat cheese. Check the sizes!!! Buy three wheels or more if you want a bigger cake, but make sure they are tiered. If they are all the same size or close it won’t look great. You’re buying a lot of cheese, so bargain with your cheese monger. This cake cost around $300. Also the top tier (goat cheese), buy 2. They are small and will get finished quickly. Flowers: Buy 1 bouquet that is the same colour scheme as your wedding or event, and 1 bouquet of baby’s breath. Don’t throw out the leaves, they are beautiful accents to this cake. Start in the middle. Do the baby’s breath first. Then slowly build around the cake. Make labels so your guests know what cheeses you chose. Place a on cake platter so it looks like a cake. And finally, have a few bowls on the table for when the flowers are removed. Flowers are not edible. Flowers aren’t your thing? You can use fruits and herbs. I did one where I used figs and grapes with rosemary. Not only did it look beautiful, it smells great.